"Occupation of Czechoslovakia" redirects here. For the 1968 invasion, see Warsaw Pact invasion of Czechoslovakia. Sudeten German pro-Nazi leader Konrad Henlein offered the Sudeten German Party (SdP) as the agent for Hitler's campaign. Henlein met with Hitler in Berlin on 28 March 1938, where he was instructed to raise demands unacceptable to the Czechoslovak government led by president Edvard Beneš. 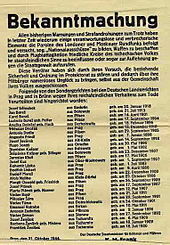 On 24 April, the SdP issued the Karlsbader Program, demanding autonomy for the Sudetenland and the freedom to profess National Socialist ideology. If Henlein's demands were granted, the Sudetenland would then be able to align itself with Nazi Germany. I am asking neither that Germany be allowed to oppress three and a half million Frenchmen, nor am I asking that three and a half million Englishmen be placed at our mercy. Rather I am simply demanding that the oppression of three and a half million Germans in Czechoslovakia cease and that the inalienable right to self-determination take its place. As the tepid reaction to the German Anschluss with Austria had shown, the governments of France, the United Kingdom and Czechoslovakia were set on avoiding war at any cost. The French government did not wish to face Germany alone and took its lead from the British government and its prime minister, Neville Chamberlain. Chamberlain contended that Sudeten German grievances were justified and believed that Hitler's intentions were limited. Britain and France, therefore, advised Czechoslovakia to concede to the German demands. Beneš resisted, and on 20 May 1938 a partial mobilization was under way in response to possible German invasion. It is suggested that mobilization could have been launched on basis of Soviet misinformation about Germany being on verge of invasion, which aimed to trigger war between Western powers. On 30 May, Hitler signed a secret directive for war against Czechoslovakia to begin no later than 1 October. In the meantime, the British government demanded that Beneš request a mediator. Not wishing to sever his government's ties with Western Europe, Beneš reluctantly accepted. The British appointed Lord Runciman and instructed him to persuade Beneš to agree to a plan acceptable to the Sudeten Germans. On 2 September, Beneš submitted the Fourth Plan, granting nearly all the demands of the Karlsbader Programm. Intent on obstructing conciliation, however, the SdP held demonstrations that provoked police action in Ostrava on 7 September. The Sudeten Germans broke off negotiations on 13 September, after which violence and disruption ensued. As Czechoslovak troops attempted to restore order, Henlein flew to Germany, and on 15 September issued a proclamation demanding the takeover of the Sudetenland by Germany. The Czechoslovak capitulation precipitated an outburst of national indignation. In demonstrations and rallies, Czechs and Slovaks called for a strong military government to defend the integrity of the state. A new cabinet—under General Jan Syrový—was installed, and on 23 September 1938 a decree of general mobilization was issued. The Czechoslovak army—modern and possessing an excellent system of frontier fortifications—was prepared to fight. The Soviet Union announced its willingness to come to Czechoslovakia's assistance. Beneš, however, refused to go to war without the support of the Western powers. Hitler gave a speech in Berlin on 26 September 1938 and declared that the Sudetenland was "the last territorial demand I have to make in Europe". He also stated that he had told Chamberlain, "I have assured him further that, and this I repeat here before you, once this issue has been resolved, there will no longer be any further territorial problems for Germany in Europe!" On 28 September, Chamberlain appealed to Hitler for a conference. 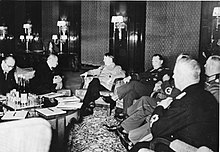 Hitler met the next day, at Munich, with the chiefs of governments of France, Italy and Britain. The Czechoslovak government was neither invited nor consulted. On 29 September, the Munich Agreement was signed by Germany, Italy, France, and Britain. The Czechoslovak government capitulated on 30 September and agreed to abide by the agreement. The Munich Agreement stipulated that Czechoslovakia must cede Sudeten territory to Germany. German occupation of the Sudetenland would be completed by 10 October. An international commission representing Germany, Britain, France, Italy, and Czechoslovakia would supervise a plebiscite to determine the final frontier. Britain and France promised to join in an international guarantee of the new frontiers against unprovoked aggression. Germany and Italy, however, would not join in the guarantee until the Polish and Hungarian minority problems were settled. On 5 October 1938, Beneš resigned as President of Czechoslovakia, realising that the fall of Czechoslovakia was a fait accompli. Following the outbreak of World War II, he would form a Czechoslovak government-in-exile in London. The partition of Czechoslovakia. First Vienna Award in red. As a result, Bohemia, Moravia and Silesia lost about 38% of their combined area to Germany, with some 3.2 million German and 750,000 Czech inhabitants. Hungary, in turn, received 11,882 km2 (4,588 sq mi) in southern Slovakia and southern Ruthenia; according to a 1941 census, about 86.5% of the population in this territory was Hungarian. Meanwhile, Poland annexed the town of Český Těšín with the surrounding area (some 906 km2 (350 sq mi)), some 250,000 inhabitants, Poles made about 36% of population, and two minor border areas in northern Slovakia, more precisely in the regions Spiš and Orava. (226 km2 (87 sq mi), 4,280 inhabitants, only 0.3% Poles). On 4 December 1938, there were elections in Reichsgau Sudetenland, in which 97.32% of the adult population voted for the National Socialist Party. 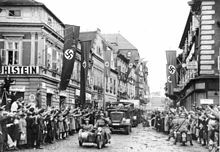 About 500,000 Sudeten Germans joined the National Socialist Party, which was 17.34% of the German population in Sudetenland (the average National Socialist Party participation in Nazi Germany was 7.85%). This means the Sudetenland was the most pro-Nazi region in the Third Reich. Because of their knowledge of the Czech language, many Sudeten Germans were employed in the administration of the Protectorate of Bohemia and Moravia and in Nazi organizations such as the Gestapo. The most notable was Karl Hermann Frank, the SS and police general and Secretary of State in the Protectorate. The greatly weakened Czechoslovak Republic was forced to grant major concessions to the non-Czechs. The executive committee of the Slovak People's Party met at Žilina on 5 October 1938, and with the acquiescence of all Slovak parties except the Social Democrats formed an autonomous Slovak government under Jozef Tiso. Similarly, the two major factions in Subcarpathian Ruthenia, the Russophiles and Ukrainophiles, agreed on the establishment of an autonomous government, which was constituted on 8 October. Reflecting the spread of modern Ukrainian national consciousness, the pro-Ukrainian faction, led by Avhustyn Voloshyn, gained control of the local government and Subcarpathian Ruthenia was renamed Carpatho-Ukraine. In 1939, during the occupation, the Nazis banned Russian ballet. A last-ditch attempt to save Czechoslovakia from total ruin was made by the British and French governments, who on 27 January 1939, concluded an agreement of financial assistance with the Czechoslovak government. In this agreement, the British and French governments undertook to lend the Czechoslovak government ₤8 million and make a gift of ₤4 million. Part of the funds were allocated to help resettle Czechs and Slovaks who had fled from territories lost to Germany, Hungary, and Poland in the Munich Agreement or the Vienna Arbitration Award. First German poster in Prague, 15 March 1939. English translation: "Notice to the population. By order of the Führer and Supreme Commander of the German Wehrmacht. I have taken over, as of today, the executive power in the Province of Bohemia. Headquarters, Prague, 15 March 1939. Commander, 3rd Army, Blaskowitz, General of infantry." The Czech translation includes numerous grammatical errors (possibly intentionally, as a form of disdain). In November 1938, Emil Hácha—succeeding Beneš—was elected president of the federated Second Republic, renamed Czecho-Slovakia and consisting of three parts: Bohemia and Moravia, Slovakia, and Carpatho-Ukraine. Lacking its natural frontier and having lost its costly system of border fortification, the new state was militarily indefensible. In January 1939, negotiations between Germany and Poland broke down. Hitler—intent on war against Poland—needed to eliminate Czechoslovakia first. He scheduled a German invasion of Bohemia and Moravia for the morning of 15 March. In the interim, he negotiated with the Slovak People's Party and with Hungary to prepare the dismemberment of the republic before the invasion. On 13 March, he invited Tiso to Berlin and on 14 March, the Slovak Diet convened and unanimously declared Slovak independence. Carpatho-Ukraine also declared independence but Hungarian troops occupied it on 15 March and eastern Slovakia on 23 March. Hitler summoned President Hácha to Berlin and during the early hours of 15 March, informed Hácha of the imminent German invasion. Threatening a Luftwaffe attack on Prague, Hitler persuaded Hácha to order the capitulation of the Czechoslovak army. Hácha suffered a heart attack during the meeting, and had to be kept awake by medical staff, eventually giving in and accepting Hitler's surrender terms. Then on the morning of 15 March, German troops entered remaining Czech parts of Czechoslovakia (Rest-Tschechei in German), meeting practically no resistance (the only instance of organized resistance took place in Místek where an infantry company commanded by Karel Pavlík fought invading German troops). The Hungarian invasion of Carpatho-Ukraine encountered resistance but the Hungarian army quickly crushed it. On 16 March, Hitler went to Czech lands and from Prague Castle proclaimed the German protectorate of Bohemia and Moravia. 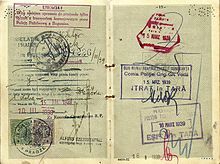 Viktor Pick's 1939 visa used to escape Prague on the last train out on 15 March. Later, he arrived safely in British Palestine. Besides violating his promises at Munich, the annexation of the rest of Czechoslovakia was—unlike Hitler's previous actions—not described in Mein Kampf. After having repeatedly stated that he was only interested in pan-Germanism, Germany had now conquered seven million Czechs. Hitler's proclamation creating the protectorate claimed that "Bohemia and Moravia have for thousands of years belonged to the Lebensraum of the German people". Thus, independent Czechoslovakia collapsed in the wake of foreign aggression and internal tensions. Subsequently, interwar Czechoslovakia has been idealized by its proponents as the only bastion of democracy surrounded by authoritarian and fascist regimes. It has also been condemned by its detractors as an artificial and unworkable creation of intellectuals supported by the great powers. Interwar Czechoslovakia comprised lands and peoples that were far from being integrated into a modern nation-state. Moreover, the dominant Czechs—who had suffered political discrimination under the Habsburgs—were not able to cope with the demands of other nationalities; however, some of the minority demands served as mere pretexts to justify intervention by Germany. Czechoslovakia was able to maintain a viable economy and a democratic political system under the adverse circumstances of the inter-war period. First issue of a Protectorate of Bohemia and Moravia 1 koruna note (1939). An unissued series of 1938 Republic of Czechoslovakia notes were marked with an identifying oval stamp on the front left side until regular issue could be circulated. Shortly before World War II, Czechoslovakia ceased to exist. Its territory was divided into the Protectorate of Bohemia and Moravia, the newly declared Slovak State and the short-lived Republic of Carpathian Ukraine. While much of the former Czechoslovakia came under the control of the Third Reich, Hungarian forces (aided by Poland) swiftly overran the Carpathian Ukraine. Poland and Hungary annexed some areas (e.g., Zaolzie, Southern Slovakia) in the autumn of 1938. The Zaolzie region became part of the Third Reich after the German invasion of Poland in September 1939. The German economy—burdened by heavy militarisation—urgently needed foreign currency. Setting up an artificially high exchange-rate between the Czechoslovak koruna and the Reichsmark brought consumer goods to Germans (and soon created shortages in the Czech lands). Czechoslovakia had fielded a modern army of 35 divisions and was a major manufacturer of machine guns, tanks, and artillery, most of them assembled in the Škoda factory in Plzeň. Many Czech factories continued to produce Czech designs until converted for German designs. Czechoslovakia also had other major manufacturing companies. Entire steel and chemical factories were moved from Czechoslovakia and reassembled in Linz (which incidentally remains a heavily industrialized area of Austria). In a speech delivered in the Reichstag, Hitler stressed the military importance of occupation, noting that by occupying Czechoslovakia, Germany gained 2,175 field cannons, 469 tanks, 500 anti-aircraft artillery pieces, 43,000 machine guns, 1,090,000 military rifles, 114,000 pistols, about a billion rounds of ammunition and three million anti-aircraft grenades. This amount of weaponry would be sufficient to arm about half of the then Wehrmacht. Czechoslovak weaponry later played a major part in the German conquests of Poland (1939) and France (1940)—countries that had pressured Czechoslovakia's surrender to Germany in 1938. The relatives of Czech paratroopers Jan Kubiš and Josef Valčík and their fellows in total 254 people were executed en masse on October 24, 1942 in Mauthausen concentration camp. Czechoslovak soldiers of the 1st Czechoslovak Army Corps on the Eastern Front in 1943. Beneš—the leader of the Czechoslovak government-in-exile—and František Moravec—head of Czechoslovak military intelligence—organized and coordinated a resistance network. Hácha, Prime Minister Alois Eliáš, and the Czechoslovak resistance acknowledged Beneš's leadership. Active collaboration between London and the Czechoslovak home front was maintained throughout the war years. The most important event of the resistance was Operation Anthropoid, the assassination of Reinhard Heydrich, SS leader Heinrich Himmler's deputy and the then Protector of Bohemia and Moravia. Infuriated, Hitler ordered the arrest and execution of 10,000 randomly selected Czechs. Over 10,000 were arrested, and at least 1,300 executed. According to one estimate, 5,000 were killed in reprisals. The assassination resulted in one of the most well-known reprisals of the war. The Nazis completely destroyed the villages of Lidice and Ležáky; all men over 16 years from the village were murdered, and the rest of the population was sent to Nazi concentration camps where many women and nearly all the children were killed. The army command coordinated with a multitude of spontaneous groupings to form the Defense of the Nation (Obrana národa, ON) with branches in Britain and France. Czechoslovak units and formations with Czechs (c. 65–70%), and Slovaks (c. 30%) served with the Polish Army (Czechoslovak Legion), the French Army, the Royal Air Force, the British Army (the 1st Czechoslovak Armoured Brigade), and the Red Army (I Corps). Two thousand eighty-eight Czechs and 401 Slovaks fought in 11th Infantry Battalion-East alongside the British during the war in areas such as North Africa and Palestine. Among others, Czech fighter pilot, Sergeant Josef František was one of the most successful fighter pilots in the Battle of Britain. Beneš's collaborators, led by Prokop Drtina [cs], created the Political Center (Politické ústředí, PÚ). The PÚ was nearly destroyed by arrests in November 1939, after which younger politicians took control. Social democrats and leftist intellectuals, in association with such groups as trade unions and educational institutions, constituted the Committee of the Petition that We Remain Faithful (Petiční výbor Věrni zůstaneme, PVVZ). The Communist Party of Czechoslovakia (KSČ) was the fourth major resistance group. The KSČ had been one of over 20 political parties in the democratic First Republic, but it had never gained sufficient votes to unsettle the democratic government. After the Munich Agreement, the leadership of the KSČ moved to Moscow and the party went underground. Until 1943, however, KSČ resistance was weak. The 1939 Molotov–Ribbentrop Pact, a non-aggression agreement between Nazi Germany and the Soviet Union, had left the KSČ in disarray. But ever faithful to the Soviet line, the KSČ began a more active struggle against the Germans after Operation Barbarossa, Germany's attack on the Soviet Union in June 1941. The democratic groups—ON, PÚ, and PVVZ—united in early 1940 and formed the Central Committee of the Home Resistance (Ústřední výbor odboje domácího, ÚVOD). Involved primarily in intelligence gathering, the ÚVOD cooperated with a Soviet intelligence organization in Prague. Following the German invasion of the Soviet Union in June 1941, the democratic groups attempted to create a united front that would include the KSČ. Heydrich's appointment in the fall thwarted these efforts. By mid-1942, the Germans had succeeded in exterminating the most experienced elements of the Czechoslovak resistance forces. Czechoslovak forces regrouped in 1942–1943. The Council of the Three (R3)—in which the communist underground was also represented—emerged as the focal point of the resistance. The R3 prepared to assist the liberating armies of the U.S. and the Soviet Union. In cooperation with Red Army partisan units, the R3 developed a guerrilla structure. Guerrilla activity intensified with a rising number of parachuted units in 1944, leading to establishment of partisan groups such as 1st Czechoslovak Partisan Brigade of Jan Žižka, Jan Kozina Brigade or Master Jan Hus Brigade, and especially after the formation of a provisional Czechoslovak government in Košice on 4 April 1945. "National committees" took over the administration of towns as the Germans were expelled. More than 4,850 such committees were formed between 1944 and the end of the war under the supervision of the Red Army. On 5 May, a national uprising began spontaneously in Prague, and the newly formed Czech National Council (cs) almost immediately assumed leadership of the revolt. Over 1,600 barricades were erected throughout the city, and some 30,000 Czech men and women battled for three days against 40,000 German troops backed by tanks, aircraft and artillery. On 8 May, the German Wehrmacht capitulated; Soviet troops arrived on 9 May. There are sources that highlighted the more favorable treatment of the Czechs during the German occupation in comparison to the treatment of the Poles and the Ukrainians. This is attributed to the view within the Nazi hierarchy that a large swath of the populace was "capable of Aryanization," hence, the Czechs were not subjected to a similar degree of random and organized acts of brutality that their Polish counterparts experienced. Such capacity for Aryanization was supported by the position that part of the Czech population had German ancestry. On the other hand, the Czechs/Slavs were not considered by the Germans as a racial equal due to its classification as a mixture of races with Jewish and Asiatic influences. This was illustrated in a series of discussion, which denigrated it as less valuable and, specifically, the Czechs as "dangerous and must be handled differently from Aryan peoples." Aside from the inconsistency of animosity towards Slavs, there is also the claim that the forceful but restrained policy in Czechoslovakia was partly driven by the need to keep the population nourished and complacent so that it can carry out the vital work of arms production in the factories. By 1939, the country was already serving as a major hub of military production for Germany, manufacturing aircraft, tanks, artillery, and other armaments. All these, however, do not indicate that the Czechs were treated lightly as demonstrated in the violent German reprisals to the Czech resistance initiatives and by over 360.000 Czechoslovak wartime casualties. The Slovak National Uprising ("1944 Uprising") was an armed struggle between German Wehrmacht forces and rebel Slovak troops August–October 1944. It was centered at Banská Bystrica. The rebel Slovak Army, formed to fight the Germans, had an estimated 18,000 soldiers in August, a total which first increased to 47,000 after mobilisation on 9 September 1944, and later to 60,000, plus 20,000 partisans. However, in late August, German troops were able to disarm the Eastern Slovak Army, which was the best equipped, and thus significantly decreased the power of the Slovak Army. Many members of this force were sent to concentration camps in the Third Reich; others escaped and joined partisan units. The Slovaks were aided in the Uprising by soldiers and partisans from the Soviet Union, United Kingdom, USA, France, the Czech Republic, and Poland. In total, 32 nations were involved in the Uprising. Reward poster for Josef Valčík, one of the assassins of Reinhard Heydrich. 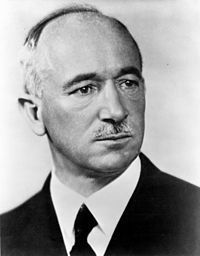 Edvard Beneš had resigned as president of the first Czechoslovak Republic on 5 October 1938 after the Nazi coup. In London, he and other Czechoslovak exiles organized a Czechoslovak government-in-exile and negotiated to obtain international recognition for the government and a renunciation of the Munich Agreement and its consequences. After World War II broke out, a Czechoslovak national committee was constituted in France, and under Beneš's presidency sought international recognition as the exiled government of Czechoslovakia. This attempt led to some minor successes, such as the French-Czechoslovak treaty of 2 October 1939, which allowed for the reconstitution of the Czechoslovak army on French territory, yet full recognition was not reached. The Czechoslovak army in France was established on 24 January 1940, and units of its 1st Infantry Division took part in the last stages of the Battle of France, as did some Czechoslovak fighter pilots in various French fighter squadrons. Beneš hoped for a restoration of the Czechoslovak state in its pre-Munich form after the anticipated Allied victory, a false hope. The government in exile—with Beneš as president of republic—was set up in June 1940 in exile in London, with the President living at Aston Abbotts. On 18 July 1940, it was recognised by the British government. Belatedly, the Soviet Union (in the summer of 1941) and the U.S. (in the winter) recognised the exiled government. In 1942, Allied repudiation of the Munich Agreement established the political and legal continuity of the First Republic and de jure recognition of Beneš's de facto presidency. The success of Operation Anthropoid—which resulted in the British-backed assassination of one of Hitler's top henchmen, Reichsprotektor of Bohemia and Moravia Reinhard Heydrich, by Jozef Gabčík and Jan Kubiš on 27 May—influenced the Allies in this repudiation. The Munich Agreement had been precipitated by the subversive activities of the Sudeten Germans. During the latter years of the war, Beneš worked toward resolving the German minority problem and received consent from the Allies for a solution based on a postwar transfer of the Sudeten German population. The First Republic had been committed to a Western policy in foreign affairs. The Munich Agreement was the outcome. Beneš determined to strengthen Czechoslovak security against future German aggression through alliances with Poland and the Soviet Union. The Soviet Union, however, objected to a tripartite Czechoslovak-Polish-Soviet commitment. In December 1943, Beneš's government concluded a treaty just with the Soviets. Beneš's interest in maintaining friendly relations with the Soviet Union was motivated also by his desire to avoid Soviet encouragement of a post-war communist coup in Czechoslovakia. Beneš worked to bring Czechoslovak communist exiles in Britain into cooperation with his government, offering far-reaching concessions, including nationalization of heavy industry and the creation of local people's committees at the war's end. In March 1945, he gave key cabinet positions to Czechoslovak communist exiles in Moscow. Especially after the German reprisals for the assassination of Reinhard Heydrich, most of the Czech resistance groups demanded, with eerie irony and based on Nazi terror during the occupation, ethnic cleansing or the "final solution of the German question" (Czech: konečné řešení německé otázky) which would have to be "solved" by deportation of the ethnic Germans from their homeland. These reprisals included massacres in villages Lidice and Ležáky, although these villages were not connected with Czech resistance. These demands were adopted by the government-in-exile, which sought the support of the Allies for this proposal, beginning in 1943. During the occupation of Czechoslovakia, the Government-in-Exile promulgated a series of laws that are now referred to as the "Beneš decrees". One part of these decrees dealt with the status of ethnic Germans and Hungarians in postwar Czechoslovakia, and laid the ground for the deportation of some 3,000,000 Germans and Hungarians from the land that had been their home for centuries (see expulsion of Germans from Czechoslovakia, and Hungarians in Slovakia). The Beneš decrees declared that German property was to be confiscated without compensation. 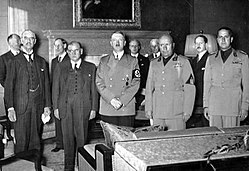 However, the final agreement authorizing the forced population transfer of the Germans was not reached until 2 August 1945 at the end of the Potsdam Conference. Residents of Prague greet the Marshal of the Soviet Union Ivan Konev. On 8 May 1944, Beneš signed an agreement with Soviet leaders stipulating that Czechoslovak territory liberated by Soviet armies would be placed under Czechoslovak civilian control. On 21 September, Czechoslovak troops formed in the Soviet Union liberated the village Kalinov, the first liberated settlement of Czechoslovakia near the Dukla Pass in northeastern Slovakia. Czechoslovakia was liberated mostly by Soviet troops (the Red Army), supported by Czech and Slovak resistance, from the east to the west; only southwestern Bohemia was liberated by other Allied troops from the west. Except for the brutalities of the German occupation in Bohemia and Moravia (after the August 1944 Slovak National Uprising also in Slovakia), Czechoslovakia suffered relatively little from the war. 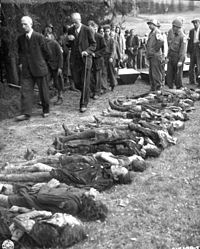 Even at the end of the war, German troops massacred Czech civilians; the Massacre in Trhová Kamenice and the Massacre at Javoříčko are examples of this. A provisional Czechoslovak government was established by the Soviets in the eastern Slovak city of Košice on 4 April 1945. "National committees" (supervised by the Red Army) took over the administration of towns as the Germans were expelled. Bratislava was taken by the Soviets on 4 April. Prague was taken on 9 May by Soviet troops during the Prague Offensive. When the Soviets arrived, Prague was already in a general state of confusion due to the Prague Uprising. Soviet and other Allied troops were withdrawn from Czechoslovakia in the same year. On 5 May 1945, in the last moments of the war in Europe, the Prague uprising (Czech: Pražské povstání) began. It was an attempt by the Czech resistance to liberate the city of Prague from German occupation during World War II. The uprising went on until 8 May 1945, ending in a ceasefire the day before the arrival of the Red Army and one day after Victory in Europe Day. It is estimated that about 345,000 World War II casualties were from Czechoslovakia, 277,000 of them Jews. As many as 144,000 Soviet troops died during the liberation of Czechoslovakia. In October 1944, Subcarpathian Ruthenia was taken by the Soviets. A Czechoslovak delegation under František Němec was dispatched to the area. The delegation was to mobilize the liberated local population to form a Czechoslovak army and to prepare for elections in cooperation with recently established national committees. Loyalty to a Czechoslovak state was tenuous in Carpathian Ruthenia. Beneš's proclamation of April 1944 excluded former collaborationist Hungarians, Germans and the Rusynophile Ruthenian followers of Andrej Brody and the Fencik Party (who had collaborated with the Hungarians) from political participation. This amounted to approximately ⅓ of the population. Another ⅓ was communist, leaving ⅓ of the population presumably sympathetic to the Czechoslovak Republic. Upon arrival in Subcarpathian Ruthenia, the Czechoslovak delegation set up headquarters in Khust, and on 30 October issued a mobilization proclamation. Soviet military forces prevented both the printing and the posting of the Czechoslovak proclamation and proceeded instead to organize the local population. Protests from Beneš's government were ignored. Soviet activities led much of the local population to believe that Soviet annexation was imminent. The Czechoslovak delegation was also prevented from establishing a cooperative relationship with the local national committees promoted by the Soviets. On 19 November, the communists—meeting in Mukachevo—issued a resolution requesting separation of Subcarpathian Ruthenia from Czechoslovakia and incorporation into the Ukrainian Soviet Socialist Republic. On 26 November, the Congress of National Committees unanimously accepted the resolution of the communists. The congress elected the National Council and instructed that a delegation be sent to Moscow to discuss union. The Czechoslovak delegation was asked to leave Subcarpathian Ruthenia. Negotiations between the Czechoslovak government and Moscow ensued. Both Czech and Slovak communists encouraged Beneš to cede Subcarpathian Ruthenia. The Soviet Union agreed to postpone annexation until the postwar period to avoid compromising Beneš's policy based on the pre-Munich frontiers. The treaty ceding Carpathian Ruthenia to the Soviet Union was signed in June 1945. Czechs and Slovaks living in Subcarpathian Ruthenia and Ruthenians (Rusyns) living in Czechoslovakia were given the choice of Czechoslovak or Soviet citizenship. In May 1945, Czechoslovak troops took possession of the borderland. A Czechoslovak administrative commission composed exclusively of Czechs was established. Sudeten Germans were subjected to restrictive measures and conscripted for compulsory labor. On 15 June, however, Beneš called Czechoslovak authorities to order. In July, Czechoslovak representatives addressed the Potsdam Conference (the U.S., Britain and the Soviet Union) and presented plans for a "humane and orderly transfer" of the Sudeten German population. There were substantial exceptions from expulsions that applied to about 244,000 ethnic Germans who were allowed to remain in Czechoslovakia. It is estimated that between 700,000 and 800,000 Germans were affected by "wild" expulsions between May and August 1945.:17 The expulsions were encouraged by Czechoslovak politicians and were generally carried out by the order of local authorities, mostly by groups of armed volunteers. However, in some cases it was initiated or pursued by assistance of the regular army. The expulsion according to the Potsdam Conference proceeded from 25 January 1946 until October of that year. An estimated 1.6 million ethnic Germans were deported to the American zone of what would become West Germany. An estimated 800,000 were deported to the Soviet zone (in what would become East Germany). Several thousand died violently during the expulsion and many more died from hunger and illness as a consequence. These casualties include violent deaths and suicides, deaths in "internment camps" and natural causes. The joint Czech-German commission of historians stated in 1996 the following numbers: The deaths caused by violence and abnormal living conditions amount to approximately 10,000 persons killed. Another 5,000–6,000 people died of unspecified reasons related to expulsion making the total number of victims of the expulsion 15,000–16,000 (this excludes suicides, which make another approximately 3,400 cases). Approximately 225,000 Germans remained in Czechoslovakia, of whom 50,000 emigrated or were expelled soon after. ^ Spencer Tucker, Priscilla Mary Roberts (2005). World War II: A Political, Social, and Military History. ABC-CLIO. ISBN 978-1-57607-999-7. ^ Lukes, Igor (23 May 1996). Czechoslovakia between Stalin and Hitler: The Diplomacy of Edvard Beneš in the 1930s. ISBN 9780199762057. ^ a b Max Domarus; Adolf Hitler (1990). Hitler: speeches and proclamations, 1932-1945 : the chronicle of a dictatorship. p. 1393. ^ Siwek, Tadeusz (n.d.). "Statystyczni i niestatystyczni Polacy w Republice Czeskiej". Wspólnota Polska. ^ Snodgrass, Mary Ellen (8 June 2015). The Encyclopedia of World Ballet. Rowman & Littlefield. ISBN 978-1-4422-4526-6. ^ Text of the agreement in League of Nations, vol. 196, pp. 288–301. ^ Gunther, John (1940). Inside Europe. New York: Harper & Brothers. pp. 130–131. ^ "Czechoslovak Bn No 11 East". www.rothwell.force9.co.uk. ^ a b Mahoney 2011, p. 191. ^ Cordell, Karl; Wolff, Stefan (2005). Germany's Foreign Policy Towards Poland and the Czech Republic: Ostpolitik Revisited. Oxon: Routledge. p. 30. ISBN 978-0415369749. ^ Gerlach, Christian (2016). The Extermination of the European Jews. Cambridge: Cambridge University Press. p. 158. ISBN 9780521706896. ^ Bartulin, N. (2013). Honorary Aryans: National-Racial Identity and Protected Jews in the Independent State of Croatia. New York: Palgrave Macmillan. p. 7. ISBN 9781349464296. ^ a b Zander, Patrick (2017). Hidden Armies of the Second World War: World War II Resistance Movements. Santa Barbara, CA: ABC-CLIO. p. 118. ISBN 9781440833038. ^ Morrock, Richard (2010). The Psychology of Genocide and Violent Oppression: A Study of Mass Cruelty from Nazi Germany to Rwanda. Jefferson, NC: McFarland. p. 27. ISBN 9780786447763. ^ Muehlenbeck, Philip (2016). Czechoslovakia in Africa, 1945-1968. New York: Palgrave Macmillan. p. 88. ISBN 9781137561442. ^ "Memorial and Reverent Area". www.lidice-memorial.cz. 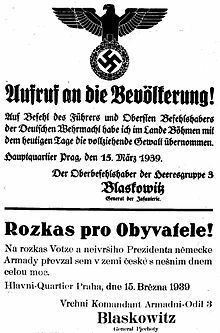 ^ "Prozatimní NS RČS 1945-1946, 2. schůze, část 2/4 (28. 10. 1945)". psp.cz. ^ Československo-sovětské vztahy v diplomatických jednáních 1939–1945. Dokumenty. Díl 2 (červenec 1943 – březen 1945). Praha. 1999. ISBN 808547557X. ^ "The Voice of Russia ( PICTORIAL ART DURING THE GREAT PATRIOTIC WAR [ Exhibition 5. WW II: The Chronicle of Stone] )". web.archive.org. 22 March 2001. Archived from the original on 22 March 2001. ^ Kenety, Brian (14 April 2005). "Memories of World War II in the Czech Lands: the expulsion of Sudeten Germans". Radio Praha. Retrieved 16 June 2018. ^ http://www.fronta.cz/dotaz/odsun-pocet-umrti#pozn1 quoting Beneš, Z. – Kuklík, J. ml. – Kural, V. – Pešek, J., Odsun – Vertreibung (Transfer Němců z Československa 1945–1947), Ministerstvo mládeže a tělovýchovy ČR 2002, s. 49–50. Hitler’s directive for "Operation Green"